Manipulation of the uterine epithelium utilising standard dose exogenous oestrogen (E2) and progesterone (P4) has been shown to achieve a mature secretory morphological response. However, in an in vitro fertilisation (IVF) setting, frozen embryo transfer (ET) has had a low success rate. We propose that in patients with previously failed ET attempts, the uterine epithelium can be directly visualised by biopsy and Scanning Electron Microscopy (SEM) and that with an individualised fine tuning of the hormone supplementation regime, based on the SEM examination of sequential uterine biopsies, it is possible to provide a uterine environment conducive to successful ET. A 47 year old women was chosen for endometrial biopsy, histopathological dating and endometrial observation utilising SEM to determine the integrity of her secretory uterine epithelium because of her age and several previously failed attempts at frozen ET. Exogenous E2 and P4 supplementation was administered in modified doses according to the SEM result, in consecutive cycles until the epithelial response appeared satisfactory for potential implantation. This case study demonstrates the dramatic change in epithelial characteristics that can be achieved as a response to these altered doses of E2 and P4. The uterine morphology changed from a hypotrophic to a mature, receptive epithelium such that ET resulted in the birth of healthy twin boys. The comparison between the consecutive biopsies in direct response to the SEM analysis and tailored modification of E2 and P4 dose clearly demonstrates, in this case, the effectiveness of individual morphological monitoring to maximise the successful outcome of ET. Although the function of the uterus is to provide an environment for implantation and pregnancy, the molecular and morphological events that occur on a regular and cyclical basis to facilitate this are not well understood. These cyclical changes occur as a direct response to the hormones E2 and P4 and can be monitored on a daily basis in conjunction with uterine biopsy allowing morphological assessment of the uterine epithelium. Utilizing repeat biopsy and examination by SEM, these cyclical changes allow hormonal manipulation and direct observation of the known morphological characteristics to be used as predictors of uterine receptivity. In conjunction with these markers, the appearance of uterodomes (pinopods)  in the secretory epithelium has become the morphological marker of choice for assessing receptivity and these structures are best observed by SEM [2–4]. Although dating, and therefore predicting, the state of the secretory epithelium in a 28 day cycle, or with known LH surge, has been well documented, ET is often not successful in a hormonally prepared uterus which cannot otherwise be visualised or assessed. It is now recognised that individual variability of the timing of these cyclical changes of known morphological markers in both the normal and ovarian stimulated cycles may be responsible [2, 5]. This variability may have a temporal effect of up to 5 days and is visualised at SEM as an 'out-of-phase' epithelium – which may include either 'advanced' or 'retarded' epithelium with respect to the appearance of the 'nidation window' [2, 3]. The visualisation of the epithelium by SEM on an individual basis can confirm an epithelium that is not in-phase with a normal menstrual cycle or not responding to ovarian or exogenous hormones in an expected manner. Serum hormone levels do not accurately reflect the status of the epithelium. Variability between the morphological response, histological dating of the epithelium and blood serum hormone levels have been reported in response to standard dose administration of exogenous E2 and P4[6–11]. Histological assessment of uterine biopsies has also highlighted inconsistency when compared to morphological assessment [3, 12, 13], or to blood serum levels [14–18]. E2 priming followed by adjunctive P4 is accepted as producing an ideal epithelium for implantation, referred to as the 'nidation window" [19–21]. However, predicting the appearance of this 'window" in an individual has proven difficult when using conventional techniques such as steroidal blood serum levels, LH surge, endometrial thickness and light microscopy histology. P4 supplementation is known to produce a receptive secretory epithelium in infertile women displaying luteal phase defect [22, 23], in the senescent endometrium and in an 'out-of-phase' endometrium stimulated for donor oocyte reception [24–27]. This P4 is also a prerequisite for the priming and maintenance of uterodomes [28, 29]. 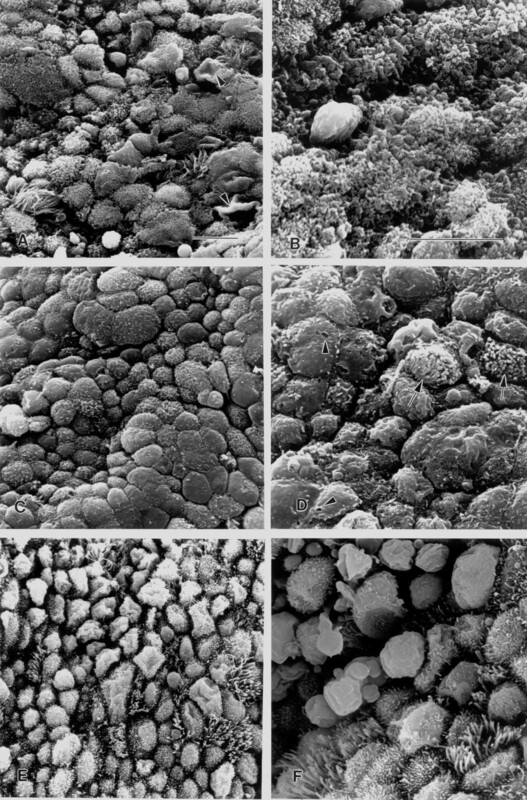 Due to the inhomogeneity of uterine epithelial response, SEM observation has the added advantage over light microscopy, of the ability to analyse a large area of epithelium [5, 30]. The benefit of this is the ability to analyse the epithelial response according to a number of factors which include the developmental stage of uterodome (pinopod) formation. Therefore, a non-responding patient with a history of failed attempts at ET, may be assisted by endometrial biopsy and SEM observation to determine whether individualised supplemental hormonal administration would assist in optimally priming the uterus for ET. Although individual variability to hormone dose concentration is well accepted, modification of the exogenous E2 and P4 concentration as a direct response to consecutive uterine biopsy and SEM observation has not been carried out extensively. A 47 year old woman attending an IVF centre gave informed consent for morphological assessment and hormonal supplementation. The woman was ovulatory, was not suppressed and had cryopreserved embryos from previous IVF attempts, prior to the commencement of this treatment. 1. Estigyn (ethinylestradiol, Glaxo, Wellcome, Australia), 50 μg for 7 consecutive days, 25 μg from D8. Provera (Medroxyprogesterone acetate) (Pharmacia & Upjohn, Sydney) 5 mg from D8. Biopsy taken D6 P4 = D20 of cycle. 2. Estigyn 50 μg for 9 consecutive days, 25 μg from D10. Provera 5 mg from D 10. Biopsy taken D8 P4 = D22 of cycle. 3. Estigyn 50 μg from D1 – D3, 100 μg from D4 – D8, 25 μg from D9. Provera 20 mg from D9. Biopsy taken D7 P4 = D21 of cycle. Uterine epithelial biopsies were taken from the anterior fundus, using a Novak curette while the patient was under sedation. Tissue was sent to histopathology for wax embedding, analysis and dating using light microscopy. The remaining tissue was rinsed in phosphate buffer (PB) 0.1 M pH 7.4) (Ajax, Australia) and placed in 2.5% Glutaraldehyde (EM grade, TAAB, Reading, UK) in 0.1 M PB for fixation. The fixed tissue was cut into 3 mm pieces, post fixed in 1% Osmium Tetroxide (OsO4) and rinsed in 0.1 M PB pH 7.4. Tissue was incubated in freshly prepared 1% thiosemicarbazide, rinsed in distilled water and reincubated in 1% OsO4 (aqueous). After further washing in distilled water the tissue was dehydrated through graded ethanols to 100%, prepared for critical point drying, mounted onto aluminium stubs, sputter coated to 20 nm with platinum and viewed using a Philips Scanning Electron Microscope (SEM) 505 operating at 20 keV. SEM was used to observe and date the endometrial morphology. The presence of uterodomes (pinopods) was graded as: absent, few, moderate or abundant; and their development as: developing, fully developed or regressing [2, 3, 31, 32]. Scanning electron micrographs of three consecutive uterine epithelial biopsies in the same patient in response to different exogenous hormone treatments. Cellular characteristics represent an atrophic epithelium (a-d) and a mature secretory epithelium D21 (e-f). Scale bar = 10 μm (a, c, e) and (b, d, f). (a) Biopsy 1: Cellular inhomogeneity: some cells distended, others flat and without cell borders. Few ciliated cells are evident. Deflated cells with bare apical membranes are also seen (arrowheads). (b) Higher power view of different area of biopsy (a). Non ciliated cells display numerous, densely packed microvilli and cover most of the cell apical membrane. Considerable cell separation is apparent. (c) Biopsy 2: E2 and P4 continued for two further days. Some areas still display large pleiomorphic cells with indiscernible cell borders and bare apices while other cells are dome shaped with low, scant microvilli. Overall, there is greater uniformity in cell shape and microvillar height. (d) Higher power view of different area of biopsy (c). Apical membrane defects (arrowheads) and ciliogenesis (arrows) are observed. Cells with bare apices, some deflated, are displayed. (e) Biopsy 3: E2 and P4 dose increased. Epithelial cells are small, uniform, clearly defined and well covered with low microvilli. Ciliated cells are more abundant with mature cilia. Secretory droplets and uterodomes (pinopods) are numerous. (f) Higher power view of different area of biopsy (e). Fully developed uterodomes (pinopods) are observed. The endometrial surface was grossly inhomogeneous displaying an alternating flat and pronounced surface topography. Epithelium was not abundant but where present had a coarse appearance. Glands were observed on raised hillocks with pronounced circular ridges and wide openings. Epithelial cell shape was inhomogeneous varying between cells being distended to flat and without borders. Considerable cell separation and dome shaped cells were observed, some with clefts dividing them. Ciliated cells were almost entirely absent and when observed displayed short and numerically reduced cilia which often had a 'splayed' appearance. Non ciliated cells displayed microvilli which were numerous, dense, medium in height and covered most of the cell apical membrane. Some cells, however, had lost apical differentiation and were bare and/or deflated, often displaying apical membrane defects. An occasional apical protrusion was observed. These displayed wrinkled, bare membranes suggestive of uterodomes (pinopods) and were found infrequently interspersed with many collapsed apical surface protrusions. Some secretory droplets were also present. The tissue was well epithelialised with open glands which were flatter than those observed in the previous biopsy although still slightly raised on hillocks. Cellular topography varied from areas displaying well defined groups of polygonal, domed cells, to areas where cells were large and pleiomorphic with indiscernible cell borders. Ciliated cells were still infrequent and when observed, the cilia were low and sparse. Ciliogenesis, ciliary buds and single cilia were noticeable. Well developed uterodomes (pinopods) were absent, however, invaginated or deflated cells with bare apices were observed infrequently. Non-ciliated cells displayed microvilli which were sparse, low and blebbed. Plasma membrane defects were frequent and moderate amounts of secretory droplets were also observed. The tissue was well epithelialised and displayed uniformity of appearance although some deep crevicing of the tissue was apparent. A moderate number of glands with flat small openings were observed. Overall, epithelial cells were small, uniform, clearly defined and well covered with low microvilli. Cell apices were predominantly domed and apical membrane defects and denuded apices were not observed. Ciliated cells were moderately abundant displaying cilia often distributed preferentially on the circumference of the cell. An increase in the number of cells with single cilia was also observed. Cell separation was not apparent and raised cell borders were few. Secretory droplets were abundant. Uterodomes (pinopods) were moderately abundant and were fully developed . The plasma membrane of uterine epithelial cells is known to undergo an orchestrated sequence of changes during the reproductive cycle. These changes have been conceptualised as "the plasma membrane transformation" [33–35]. SEM has been particularly useful in examining one aspect of the plasma membrane transformation, the well studied 'uterodomes' (pinopods) in human uterine epithelial cells [1–3, 21, 36]. However, it is the post-ovulatory influence of P4 that allows the morphological changes of the uterine epithelium to be dated on a daily basis and also allows these morphological markers to be used as a model against which to evaluate the results of the present case report [37–39]. Tissue inhomogeneity was observed between samples of each biopsy but due to the amount of tissue available and because SEM allows a large area to be analysed, these differences were found to be consistent between samples. For morphological assessment, areas with the most advanced characteristics were utilised. Tissue from the first biopsy showed an atypical epithelial reaction to steroidal therapy that reflected an incomplete response and indicated the need for dose and/or duration of treatment modification. The glands appeared to be under an oestrogenic stimulus suggesting a lag in development, yet the luminal epithelium displayed epithelial characteristics suggestive of a late luteal or predecidual phase of the cycle. However, the lack of ciliated cells was strongly indicative of an hypotrophic or understimulated endometrium [40–43]. This heterogeneity may occur with insufficient dose or duration of E2 and insufficient P4 to sustain the luteal phase. It is probable that this tissue appearance was the response of a previously under stimulated epithelium to the initiation of hormone supplementation . SEM analysis determined the epithelium to be 'hypotrophic' and not reflective of the expected epithelial response for the biopsy date, D 6 P4 = (D20). The histopathology report dated the biopsy as D23-25. As a consequence of the SEM findings, the ensuing cycle of treatment extended both E2 and P4 therapy by 2 days prior to biopsy. Tissue from the second biopsy demonstrated a greater progestogenic influence than the previous biopsy. This was observed in greater uniformity of cell shape and the reduced length of microvilli (D 8 P4 compared to D 6 P4 in the first cycle). The effect of longer E2 (D 9 E2 compared to D 7 E2 in the first cycle) was seen in the reduced gland size and profile and in the occurrence of ciliogenesis. However, the hormone regime was still not sufficient to produce mature cilia. Seven days of E2 priming, in the proliferative phase, has been reported as sufficient for a mature secretory phase to progress [4, 45], however, the presents results indicate variable individual responsiveness or an E2 dose insufficiency. Although there was an overall increase in cellular uniformity, enough inhomogeneity of cell shape, areas of denuded cell apices, plasma membrane defects and single cilia remained to suggest some epithelial hypotrophy. The histopathology report dated the specimen as 'early secretory ', D18-19, which did not reflect the hormone priming biopsy date of D8 P4 = D22. In response to these SEM findings, the E2 dose was further manipulated and increased and the P4 concentration increased from 5 to 20 mg daily. In contrast, the tissue from the third biopsy was well epithelialised and displayed oestrogenic characteristics such as an increase in the number of cells exhibiting an abundance of cilia as a result of a higher concentration of E2. The higher concentration of P4 was evident in the abundance fully developed uterodomes (pinopods and uniform smaller cells without defect and when present, short, stubby microvilli. Although the histopathology report dated the epithelium as early secretory equal to D19, the SEM findings, with the presence of fully developed uterodomes, found the actual biopsy date of 7 P4 equal to D21 to be more accurate. Although an occasional uterodome was observed at D6 P4 = biopsy 1 (interspersed with collapsed apical surface protrusions), they were not observed at D8 P4 = biopsy 2, and were observed in abundance at D7 P4 = biopsy 3, where they were fully developed. The difference between D7 and D8 P4 for observation of uterodomes was one of P4 concentration rather than P4 duration, highlighted by the other generally understimulated morphological characteristics at D8 P4 = 2nd biopsy . In summary, the results of the first two biopsies demonstrated an epithelium that was hypotrophic or representative of an E2 only effect. This suggests that the epithelium was understimulated prior to the commencement of exogenous therapy and that the initial P4 dose was insufficient to produce a secretory epithelial response. An improvement in epithelial uniformity was seen after 2 further days of E2 and P4 treatment, although the improvement was slight in the context of all the morphological variables considered. However a dramatic difference in the epithelial architecture was observed on the third biopsy. The epithelium was representative of an expected D21 (7 P4) with small uniform cells, distended apices covered in low microvilli, an increase in ciliated cell numbers and an abundance of fully developed uterodomes [2, 3, 32, 38]. This secretory epithelial response was achieved by increasing the P4 concentration fourfold in response to earlier SEM biopsy observations which had indicated a poorly stimulated epithelium. Hormone supplementation was increased until a satisfactory secretory epithelium was obtained with SEM observation. The presence of uterodomes (pinopods) was used as a marker for timing ET. This case report demonstrates the morphological response of an impoverished uterine epithelium in direct response to altering the dose and duration of P4 and E2 administration over three consecutive cycles. The appearance and abundance of uterodomes in response to this treatment by the 3rd biopsy, are accepted 'nidation' markers for subsequent ET. The patient underwent frozen embryo transfer in the 4th consecutive cycle, using the same hormonal supplementation as the 3rd treatment cycle, and gave birth to healthy twin boys. This successful outcome illustrates the utility of SEM as a tool, on a case by case basis, to evaluate manipulation of the menstrual cycle in patients who have previously failed to achieve implantation with ET.